“Inventing van Gogh,” by Steven Dietz, is the story of Vincent van Gogh as hallucinated by Patrick Stone, a present day artist; or is it the story of Patrick Stone, as hallucinated by van Gogh? It’s both, and much more. It’s a mystery, a discussion of art, a commentary on artists, and an enjoyable and thought-provoking evening at the theater. This is a very intelligently written play and it is well-directed by Toby Wilson. The first thing you notice is that set, beautifully designed by Ted Vitale and James Wolf simulate van Gogh’s painting, “Bedroom at Arles” on one side of the stage, and Patrick Stone’s derelict art studio in a condemned warehouse on the other side. The colors glow, a perfect setting for discussion of van Gogh’s genius. Action shifts from one side of the room to another, sometimes in both simultaneously, and time periods shift too, as do the roles the actors play. Part of the fun is keeping track of who’s who and how the scenes and time frames relate to each other. Though you don’t need to be an art history major to enjoy this play, it does help to have a basic knowledge of van Gogh’s life and an interest in art. There is plenty of fascinating discussion of the nature of art and artists, which seems to be closely based on van Gogh’s letters (he wrote about 800 of them, expressing his philosophy on art and related topics). Patrick Stone, played by Joshua Koopman, is the contemporary artist who is hired by an unscrupulous art authenticator Bouchard (Michael Weber) to paint the “last self-portrait” of van Gogh, which was apparently painted a couple of months before he died, but never found. “We have no proof that there is no painting,” says Bouchard. Stone, tortured by the death of his former professor, Dr. Miller (Peter Hirst), is blackmailed into complying with Bouchard’s demands. 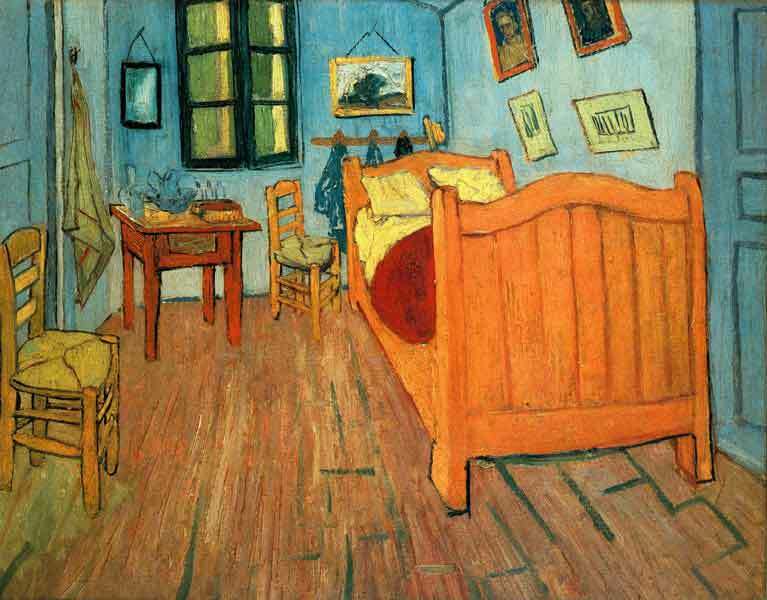 Though he has not been able to paint since the Dr. Miller’s death, he reluctantly sets out to create the self-portrait, grumbling that van Gogh is a “myth,” the “most untalented and overrated artist in the history of the world.” His task is complicated by his relationship with his sometime girlfriend, Hallie Miller (Jessica Adams), daughter of his former professor. In painting the portrait, Stone “invents” Vincent van Gogh, vividly played by Richard Martin, who looked remarkably like the artist, red hair and beard, wild-eyed expressions, and all. Van Gogh vacillates between thoughtful and crazed, and Mr. Martin does a remarkable job bringing the artist to life (or into a hallucination), during the final months of his life. Mr. Hirst, as Dr. Miller, provides historical details, with the passion of a teacher devoted to his subject matter, as his story is interwoven into the plot. The three supporting actors, Mr. Weber, Mr. Hirst, and Ms. Adams, each play two characters, one in the present day and a corresponding character in van Gogh’s time. The interplay among the characters is very well done, as they seamlessly become the other..
Care has been taken with the costumes, which were created to resemble clothing worn by the characters in van Gogh’s portraits. “Inventing van Gogh” continues through April 20 at the Cotuit Center for the Arts. Performances are Fridays and Saturdays at 8 PM and Sundays at 2 PM. General admission tickets are $18, $16 for seniors, $12 for CCftA members and $10 for students. To reserve tickets, call the box office at 508-428-0669. For more information, visit www.CotuitCenterForTheArts.org.